I was in my third year of graduate school at the University of Texas when I received an invitation from Auburn University to spend a summer teaching in the Mathematics Department. I was to be a Visiting Assistant Professor and the pay was pretty good compared to my Graduate Teaching Assistantship salary. This was when it occurred to me that I might look at the possibility of buying a car. I only considered buying a 55 Chevy and nothing else would do. So I proceeded to scour the used car lots in Austin looking for them. I found the one I wanted and the price was $550. This was a major investment for me to face and I would need a loan. It so happens that one of Dr. Wall's students (Dr. Wall was my thesis advisor) was a successful investor and had just become president of one of the local banks. I was advised to go and talk to him and so I walked right past the loan officer and went straight to the president. I told him about my job at Auburn and he called the loan officer and told him to write up the loan. And just like that, I had wheels. It was a green and white, four door 55 Chevy with a straight six engine (commonly called the hot water six). It also had an air conditioner, which had been added on - not factory. It was exactly what I wanted and boy was I proud. Before the semester was over, I took it on some caving trips including a trip to Mexico. But the main purpose was to drive it to my summer job in Auburn Alabama. As soon as I got settled in Auburn I went to the faculty sponsor of the Auburn Caving Club (J. D. McClung) and asked about doing some caves in Alabama. He told me that there was very little activity going on and the only caver he knew of in the area was a girl in Opelika named Diane White. I was disappointed; I had expected to see a thriving cave club in Auburn. But we did get together and do a few caves with some people from Huntsville and Birmingham. As the summer went along, the old Chevy could be seen more and more frequently parked at the end of White Road in Opelika. Sometimes a song or two would be sung accompanied by a cheap Mexican guitar. There ensued marriage, graduation, moving to Utah, a professorship for Sam, graduate school and graduation for Diane, good times, bad times, moving to Texas and moving to Alabama. The old Chevy accompanied us through all that, pulling a rental trailer from one point to another. We had another car and after we built the house and bought a pickup, the Chevy was not getting driven enough to keep the battery charged. Every now and then when I was driving it, someone would pull up next to me at a stoplight and ask me if I wanted to sell it. Finally, I went to a man who collects cars and asked him for an appraisal (there is a national organization of owners of 50's vintage Chevrolets). I put a for sale sign in the window of the car and there was no shortage of offers. A mechanic wanted it for the drive train but I did not want someone to tear it down. I wanted someone to fix it up. Then, along came a young man who was taking a course in auto bodywork at the local trade school. He wanted it real bad and promised to fix it up nicely. He paid me $500 and drove it away. I was hoping that I would see the car again some day driving around Opelika. Even if it was repaired and painted I think that I would have recognized it since it was a four door and the collectors always prefer the two door. I have not spotted it but after all these years my eye quickly finds any 55 Chevy that I encounter on the road. Every time I see one, there is a flash of memories that spills over me taking me back to those other times and places. 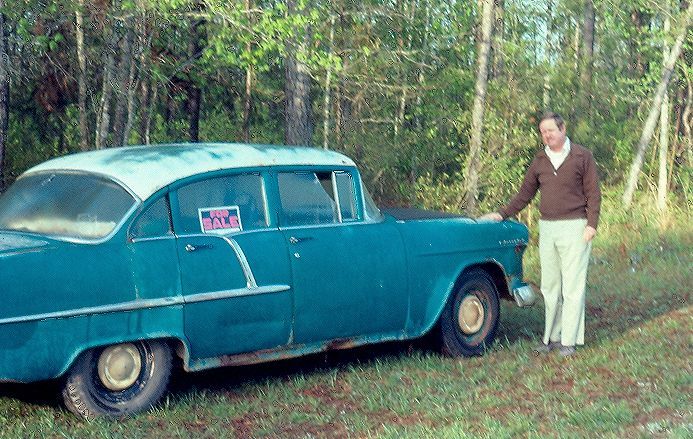 That old car was a part of my life and some day I will dig through that dusty old box of pictures and pick out the ones that show the 55 Chevy. The Christmas following that summer in Auburn, I drove to Opelika to visit Diane. I was caught by a terrible winter storm. There was snow and ice on the road. This was while the interstate highway was being built and the bridge over the Mississippi at Vicksburg was still the old Huey Long two-lane bridge. I learned later that a 18-wheeler had jackknifed on the bridge. Even after the wreck was cleared up, the traffic was only going one-way. I had run into stalled traffic at least 20 miles from the bridge. Nothing moved for hours. I could not run the engine and heater because of fear of running out of gas. (Some people did run out of gas). I entertained myself by wrapping up in a quilt and playing the guitar. It was at least 5 hours before I got across that bridge and made my way toward Opelika in the Chevy. On the trip back to Texas, I was in the middle of a long narrow bridge in Mississippi going at highway speed in the rain when all of a sudden there was an explosion. My hood was gone and I saw it in my rear view mirror lying in the middle of the bridge. I managed to retrieve the hood and tied it down. The roof of the Chevy above my head was dented almost down to my head where the hood ornament hit. I made it back to Austin and made repairs. The previous owner had cut the supports for the hood holddown in order to make room for the air conditioner. The remainder of the holddown had eventually fatigued. I found a hood at a junkyard and put it on. At the end of a year of marriage and a year in Austin we made a trip to Opelika to visit with Diane's family before moving to Utah. On the way back, traveling through Mississippi (again! ), we were pulled over by the Mississippi Highway Patrol. I was told by the officer that I had crossed the yellow line. He led us directly to the justice of the peace of Chunky, Mississippi. Even though I was sure that my only crime was driving through Chunky with an out of state tag, I pled guilty and the distinguished judge fined us $11.50 - No Checks Accepted. We had exactly $11.50 and an oil company credit card. Having been stripped of our entire cash supply, we made it back to Austin on the credit card. The car was stolen once. It was sitting in front of our house in Salt Lake City with two feet of snow on top of it. The police found it the next day behind a bowling alley downtown. It had been run into a power pole. Some teenage yahoos had taken it for a joy ride. The car was also towed once by the police. We had some neighbors who did not like us or our vintage car parked majestically in front of the house. One day the car was parked facing the wrong direction. This is against the law and our neighbors seized the opportunity to call the cops and have it towed. On one very cold Utah morning, we had to get to the airport to catch a plane to San Francisco. Our Volkswagen would not start and it was getting late. Finally, in desperation, we went out and tried the Chevy and sure enough, it started. We knocked the snow off of the windshield and roared out to the airport just in time to catch the plane. We left Utah in late summer 1971. I had lost my job, Diane finished her Ph.D. and neither of us had even the prospect of a job. We decided that if we are going to be two unemployed phuds, then we might as well do it in Austin. We loaded up a rental trailer, hooked it to the Chevy and headed south. Diane drove the VW and I piloted the Chevy pulling our worldly possessions. 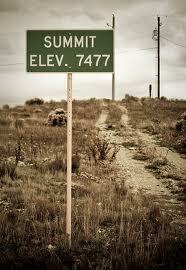 There is one high mountain pass getting out of Utah to the south, called Soldier Summit. I knew I would be in trouble getting over that pass with the Chevy pulling such a heavy load. Sure enough, it was all the poor car could do to make about 20 miles an hour in second gear. It is a very long incline, several miles, but thank goodness there were occasional places to pull over. With no place to pass, the cars would stack up behind me and I would pull over when I could to let them go by. Diane was driving ahead of me and would stop and wait for me to catch up. The engine heated up and got closer and closer to the boiling point. I was talking to the old Chevy all the way up. Finally, I saw the summit and the steam was starting to come out from under the hood. I was yelling by now. "Come on! - We can make it! - We can make it!" It was the end of a part of my life. It was the beginning of the unknown. I was sure that my career as a professor was over and I was very bitter about it. All sorts of things were running through my head. Reaching that summit summarized the diverse feelings of anger, frustration, sadness and the exhilaration of escape. Diane was waiting at the top. We pumped our arms in a cheer. There were tears running down my face. The car started down the grade and the temperature gauge fell to the normal level. The cool mountain air blew through the cab. We were headed for West Texas to visit my parents on our way to Sholtz's Beer Garten in Austin. My 55 Chevy had been parked there before.